Hi everyone.. I hope you are having a great start to the week so far! 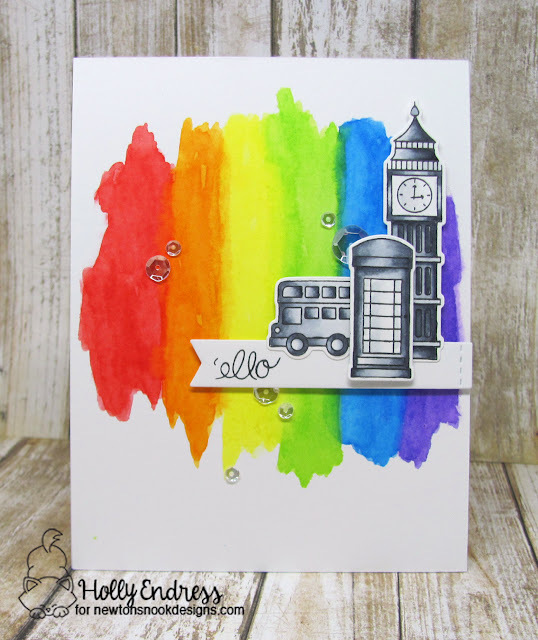 I'm up on the Newton's Nook Blog today with a fun card featuring the Newton Dreams of London stamp and coordinating Die set. 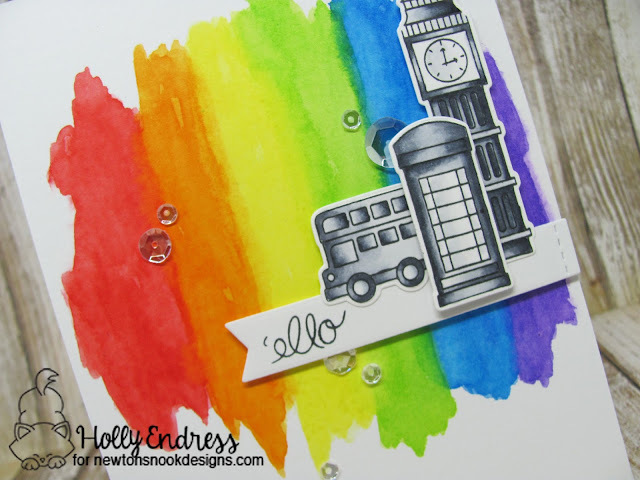 I started with a piece of Distress Ink Watercolor paper and I added some Distress Inks in Rainbow Colors. Candy Apple, Spiced Marmalade, Squeezed Lemonade, Twisted Citron, Salty Ocean and Wilted Violet. I dried each color in between so they wouldn't bleed and become muddy. 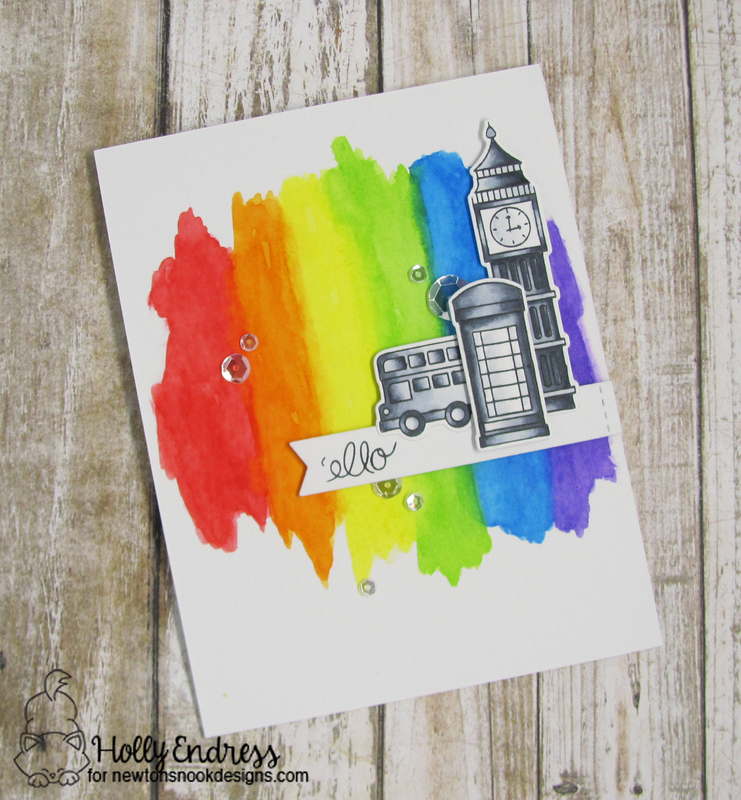 I adhered the panel to a top folding White card base and then I stamped the images from Newton Dreams of London onto some Neenah Solar White card stock and colored them in with Copics. I used all Grey's C00, C1, C3, C5 & C7. Once the images where die cut I also stamped the sentiment from the same set onto a piece of White card stock and die cut it out using a banner die and then I adhered the images over the banner securing everything with foam tape. I adhered the banner along the edge of the card front. For a pop of Sparkle I added some Mixed Sparkling Clear Sequins from Pretty Pink Posh. I love how this came out.. Way better then I expected and this set is a must HAVE!! Head over to the Newton's Nook Blog for more inspiration from the Design Team! So beautiful! I love the contrast of the rainbow background with the monochromatic city! So fun!